Preamble: When my husband sync’d his Kindle with mine and saw, for the first time, just how many (heretofore invisible) Kindle titles I owned… he literally sputtered. Then he tweeted a screenshot of the ridiculousness. I am a giant nerd. I read absolutely everything. 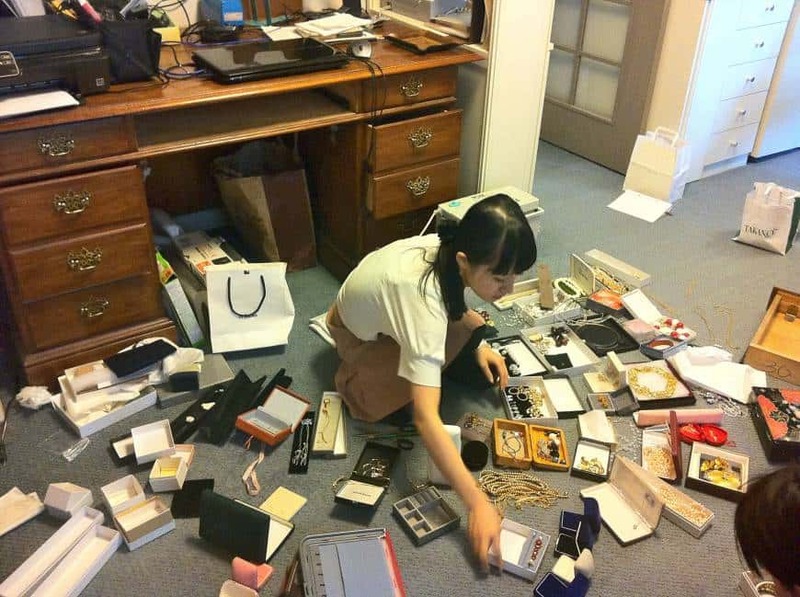 Right now I’m reading a book called The Life-Changing Magic of Tidying Up, by Japanese organizing expert Marie Kondo. It’s amazing. I can’t recommend it enough. Already, I’m feeling an increase in lightness, beauty, and joy in my home. But that wasn’t the reason I started reading it to Alex during one of our Skype calls last week. Nope, I shared it with him because of a deeper truth, and its masterful presentation. The Life-Changing Magic of Tidying up isn’t just about tidy homes, it’s about life. The book itself is so good because it throws out every traditional piece of advice. Marie proves it: Little by little won’t solve the problem. Storage won’t fix the problem. Fancy boxes and shelves and “one thing a day” won’t get you there, ever. Otherwise you’re just rearranging deck chairs on the titanic. The messy-house problem doesn’t occur on the day-to-day level. You may think you “just aren’t good at it,” but that’s because you’ve been working on the wrong end of the problem your whole life. The problem occurs upstream. You can’t solve it on the day-to-day level. You have to attack it where it starts, and nothing else will do. It’s true of tidying — Marie convinced me. And it struck me so forcefully because firstly she is an excellent teacher, and secondly because I know that it’s true of business, too. Alex and I have taught so many students — business newbs, business failures — who have, altogether, gone on to gross multiple millions in revenue. The lessons from this book? Virtually the same lessons we have learned ourselves in business, and what we do our damnedest to teach our students. The previous failures, the negative self-talk, the self-perpetuating cycle, the backsliding that terrifies our students… it’s all exactly the same as Marie describes in her students. Only the implementation details change. We’ve all spent a lifetime absorbing the wrong lessons, the wrong advice. But, as Marie writes, if you do things right, just once… if you simply experience just how amazing the right way feels, just once… you will be forever changed. The failures, the negative self-talk, the backsliding all become irrelevant. You’ll see them for what they are: fatal flailing in quicksand. Get yourself on firm ground for once, and you won’t need to flail any more. But until you’ve felt solid ground, you simply don’t understand what you’ve been missing. Listen to our conversation to learn the revolutionary approach Marie teaches for tidying, and how those lessons apply to your startup, too. Bonus: life (and business) wisdom from ancient Chinese philosophers, 500-year-old French noblemen. This is part one, clocking in at about 30 minutes. If you wanna listen to these on your phone, you can listen to Episodes 6 and 7 of Stacking Bricks podcast from iTunes or wherever you like listening to podcasts Enjoy! For starters, our podcast feed is chock full of more insider dirt. And stay tuned, because every week we’re publishing more discussions like this one as we build out the brand new 30x500. Even behind-the-scenes time lapses of me designing the lessons themselves!